The Amcrest ProHD wireless IP camera helps you stay in touch with what you love anytime and anywhere by having secure access to your camera's video stream in no time. The Amcrest ProHD wifi camera allows you to stream live and playback recorded video of your home, your kids, your pets, or your business on the go with the Amcrest View app. Amcrest IP cameras can record the video to an internal MicroSD card, upload to an FTP as well as record to any Amcrest Network Video Recorder (NVR). In addition, Amcrest Cloud offers optional cloud recording with free live viewing and 4 hours of free video storage accessible from any device including Apple Mac, Windows PC, iPhone, iPad or Android devices. You don't have to be tech savvy to get camera setup quickly and painlessly. Simply power it on, download the Amcrest View mobile app, scan the QR code, and within just a few taps you’re ready to go. Day to day operations are a breeze thanks to the simple interface which allows you to take advantage of the camera's powerful features. The Amcrest ProHD camera has been meticulously designed to make plug and play setup a reality not just in theory, but in practice. When it comes to security, this Amcrest ProHD camera features secure SSL connections via HTTPS as well as uses AES encryption for wireless devices to comply with modern WiFi standards for encrypted connections. This way you can always be assured that, as you play your footage, you’re also playing it safe. With the Amcrest ProHD, you'll never be out of the loop again. Amcrest wifi IP cameras are compatible together with Foscam cameras only when using AmcrestCloud, Amcrest NVRs, Blue Iris for Windows PC, Live Cams Pro for iOS and TinyCam Monitor for Android. 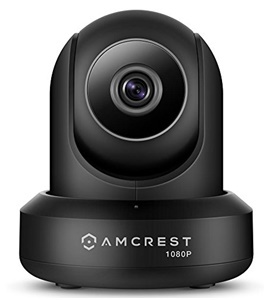 Check out here to learn more about this Amcrest ProHD wireless IP camera. This person Hector Lea ran through and set up all my cameras remotely. I know that sometimes the difference in the idioms of India are confusing for us here is the states. But this guy Hector Lea (stage name) is actually really good. He didn't get caught up with the 'double negatives' (ei. No I can not) like the Philippine Call Centers reading from a script. Hector was patient and fast. He saved me time. The older I get, the less I want to learn complex instruction that I will use but once. I originally bought the Logitech Circle camera at the same price and ended up returning it because the picture quality was terrible and it didn't have pan/tilt (the most commonly desired feature!) After reading other reviews, I went with this one. This camera is AWESOME. Fantastic picture quality in both day and night mode, super light and portable so you can put it anywhere in the house, and the range for the pan/tilt is huge. My favorite part is the two way talk, which is crisp and clear from both sides. It was incredibly easy to set up as well, and pretty much guides you into locking it for network security, so you don't have to worry about your stream being accessible by anyone else. I use this to watch my pets during the day. It started off as a silly christmas present idea for my partner, so he could spy on the cats. But now we both end up watching the camera a lot! In just the short time since I've purchased this, FIVE coworkers have now come to Amazon to buy the same camera to watch THEIR pets as well. Almost weekly someone is asking about All of us love the camera and use it all the time! I am super happy with this purchase and will likely buy a second one down the road if I have a bigger place and will continue to recommend it to anyone looking for a security camera. Camera is of decent quality. It constantly makes an annoying clicking sound as it clicks back and forth from day to night vision. Apparently the controls for turning night vision on and off don't work, or at least for me. Also, the microphone is useless, as it only works intermittently, kind of in and out every second or so. First one that I received was DOA. I received a replacement two days ago and had it working for a day, then the connection stopped. I could not connect to the camera, even with multiple resets and re-configurations. Also, the camera randomly moves and "looks" around the room which freaks my wife out. I wanted to look for a setting that might be related to it so that I can disable the PTZ function, but I can't connect to the camera. I requested for another replacement and if that fails, I will give up on this camera and look for an alternative. I really hope that there's no random people connecting to our camera. Video is absolutely beautiful when in HD!! Even SD is good. I have a Dropcam and the video on this is WAY better. However there is room for improvement. The app sometimes doesn't sync up with the camera. Also panning depends on your wifi connection. It may take 3-5 seconds to pan. It may take 20-30 seconds to pan. The app passwords vs the password set on the initial setup of the camera don't work well together. It seems that if the password is over 6 characters you're hosed. You can log in via the app but you have to enter only the first 6 characters. The setup was okay but it's finicky. I've tried setup on another phone and I've had to reboot the camera in order for it to take. Dropcams setup was far easier. Check more user reviews here .